"Artist-in-residence programs give artists the opportunity to live and work outside of their usual environments, providing them with time to reflect, research, or produce work. During a residency, artists can explore new locations, different cultures, and experiment with different materials. Much like study abroad programs, residencies are often aimed at young artists and can end up having a long term impact on their life and work." Documented below are residences at areacreativa42, Rivarolo Canavese, Italy and Wallington in Northumberland, England. Harvey spent a month at the cultural centre areacreativa42 in Rivarolo Canavese, north of Turin in the summer of 2017. Below are some images of both the visit and the paintings completed or composed during his time as an artist in residence there. The residency at Wallington was in conjunction with Northumbria University and also involved other artists. “exhibitions to be held in homes and musty museums, with access to sofas, tables, chairs and cups of tea. The surroundings in which art is experienced (rather than viewed) should not be artificial and vacuous." 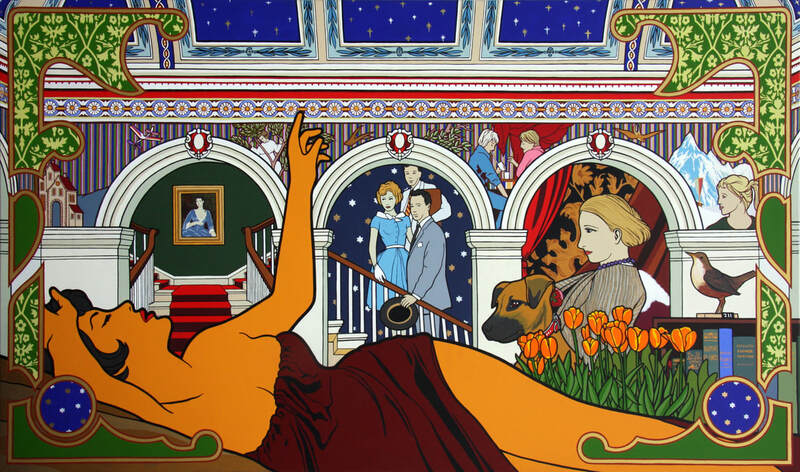 The Stuckist insistence on painting being “the medium of self-discovery” is a concept William Bell Scott may have identified with, and the Stuckist show at the Walker Gallery in 2004, “The Stuckists Punk Victorian” develops closer ties to the work in the Central Hall. 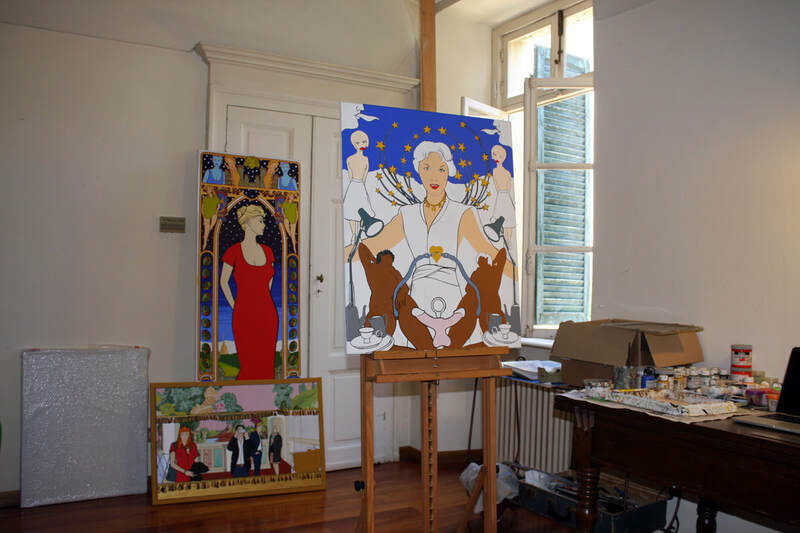 Stuckism promotes the idea of figurative painting, and the work of Bell Scott, and in fact the work throughout the house, acknowledges this medium. According to the Stuckist manifesto, painting “engages the person fully with a process of action, emotion, thought and vision, revealing all of these with intimate and unforgiving breadth and detail.” This could have been written about the eight paintings that the artist was asked asked to consider. William Bell Scott is one of those individuals who look different in each photograph and painting sourced. Consequently this is more a psychological portrait than a physical one. It was also a final opportunity to have some kind of dialogue with him before the work was transported up to Wallington. The title “Art & Leisure” refers to the Bell Scott title “Iron and Coal”, and as such comments on the changing nature of the role of both Wallington and Northumberland, and continues the story told by the eight paintings in the Central Hall. Its message is very much open to interpretation. The artists input is related to early memories of being taken around National Trust properties in the Sixties as a young child, not understanding the significance of the properties, but enjoying the cafés within the grounds, where he could drink pop and stare at the brightly coloured clothes of the customers. ‘Unfinished Business’relates to the drawing by Bell Scott hanging in Wallington outlining his plans for the hall, which were never completed. There are many elements within this painting that can be found throughout the property, as well as elements that reflect the artist’s own intervention into the space. It is essentially a celebration of all that is wonderful about Wallington, as well as suggesting some unrealised potential. “Mother & Child United” was the first of the paintings completed for the project and as such has very blatant references to the Bell Scott paintings and the Central Hall generally, as well as referencing the gardens. It also includes elements of the needlework screen made in 1727 by Julia, Lady Calverley. It’s purpose is to represent initial reactions: of the elements that had the most impact on the first visit. It is about immediacy as opposed to lengthy contemplation and reflection. “Swiss Alps (after Ruskin)” adds elements to Ruskin’s original drawing on show at Wallington, and features an employee of the café standing next to it’s coffee machine. The painting contradicts the more difficult elements of Ruskin’s personality, and attempts to defy them. “Local News” accepts and highlights the intervention of the artist whenever this type of project is undertaken, and takes a significant element from Bell Scott’s final painting in the series, the newspaper. It also refers to the fact that the Central Hall was unfinished in the time of Bell Scott, and wonders what it would be like if it had been.